Taking a taxi in Korea is very convenient for international visitors, with an increasing number of taxi drivers being able to speak English. Taxis can be found at taxi stands in most busy city areas or hailed on the streets. There are also call taxis that can be requested by phone. However, call taxis start with a higher base fare than the taxis you flag down on the street. The base fare will vary by region, but taxis all use the same fare calculation of increase by time and distance traveled. While virtually all taxis operating in the Seoul area accept credit cards or transportation cards, it is possible that some taxis in the outlying or isolated regions may request cash only. Keep this in mind and make sure to have some cash (in Korean won) with you if you plan to use a cab in remote areas. 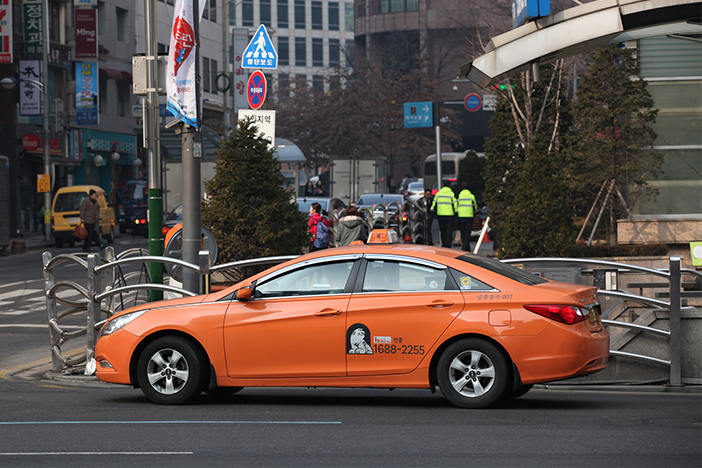 Standard taxis have different colors depending on their region; the standard taxis in Seoul are generally orange. The metropolitan areas and other cities feature many silver colored standard taxis. The blue sedan taxis that can be found in Seoul are enviromentally friendly electric cars. Taxi fare for electric taxis costs the same as the regular standard taxis. Unlike regular taxis, Coop taxis are operated by Taxi Cooperative Network and can be distinguished by their bright yellow color and logo. Base taxi fare is the same as other standard taxis and can often be seen in Seoul, Pohang, Gyeongju, Daegu, Gumi, and Gwangju. Called “model taxi” in Korean, deluxe taxis are black with a yellow sign on the top. Both sides of the taxi have the Deluxe Taxi sign. They offer slightly more passenger space and a higher standard of service than regular taxis. This means that the basic fare and the fare for additional distance are higher than regular taxis, but there is no late-night surcharge. Deluxe taxis can generally be found at stands located in front of hotels, stations, bus terminals, and major city streets. A van taxi that can accommodate six to ten passengers is also available for larger groups. Jumbo taxis provide simultaneous interpretation by phone for certain languages, and are equipped with a receipt-issuing device and a credit card reader. Fares are the same as deluxe taxi. Because they are quite similar in appearance, a jumbo taxi can often be confused for a call van. A call van charges by size and volume of luggage, and negotiates taxi fare with passengers instead of charging by the meter. If you need a jumbo taxi, be sure to check for the jumbo taxi label on the side of the van. Negotiated with the driver beforehand depending on the luggage size/quantity/weight (Minimum size: 40x40x40 cm / Minimum weight: 20 kg) and travel distance. Same as deluxe taxis. Additional charges apply when using a call taxi or taking toll roads. Look for "VAN," "CALL VAN," "용달화물," or "콜밴" on the body or top of the car. "JUMBO TAXI" or "대형택시" are indicated on the vehicle. Korea offers special international taxis, which are driven by taxi drivers who can speak one or more foreign languages such as English, Japanese, or Chinese. International taxis look the same as standard taxis, except they feature the words "International Taxi" on the body and top of the car. Reservations : Accepted via call center (+82-2-1644-2255 / Korean, English, Japanese), e-mail (reserve@intltaxi.co.kr), and online. Payment methods : Cash (Korean won), international credit cards (MasterCard, Visa, AMEX, Unionpay, JCB) or Tmoney. A passenger may call for a taxi whenever needed, hence the term call taxi. An additional fee may be charged for the call service, but call taxis are considered safer than regular taxis hailed on the street as the driver’s name and taxi’s plate number are given upon making a call. Most call centers only offer services in Korean, so travelers who do not know Korean may have difficulties in using the call service. No surcharge for use of deluxe and jumbo taxis. This page was last updated on March 08, 2019, and therefore information may differ from what is presented here.